Constructed using webbing weaved throughout; luxurious feather cloud fill consisting of foam core, channel filled with 45% feather, 5% down and 50% fibers. Upholstered in "Brevard Espresso" 100% linen. Swatch samples available on request; sample will be mailed for approval before order goes into production. Diamond tufted seat. This is a custom made to order ottoman. Please allow a 10-12 weeks lead-time; deposit required, all sales final. Leather option also available. Fabric is not treated with Scotchguard™. Designed and hand crafted in Los Angeles; Customer's Own Material option available. Customer's Own Leather option also available - 81 sq. ft. required. Please contact us for details. Go ahead, take a seat. This ottoman is built to do double duty as a stylish place to sit or rest your feet. 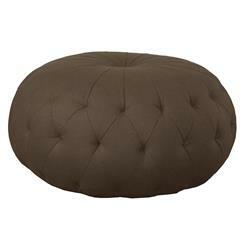 Button tufted and filled with the finest, firm filling, this ottoman makes a stylish addition to a wide variety of interior styles from Global Bazaar to Eclectic Modern and beyond. Upholstered in a denim blue linen, this ottoman can also be covered in whatever fabric you choose. The possibilities are endless.